First comes a need. Then an inspiration. Followed by a little ingenuity and a lot of work. And, voila, a problem is solved and a need is met. While that’s the formula upon which whole civilizations are built, members of the Buffalo River Chapter BCHA had something a little more elemental in mind. 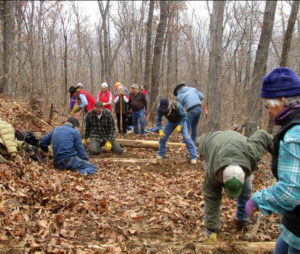 After receiving a significant grant from the Arkansas Highway Commission, the group assumed responsibility for repairing part of the Cecil Cove Loop on the Buffalo National River. This commitment meant there was a lot of gravel to be moved…. a lot of heavy gravel. Last fall we reported how three of our members, Peter and Nancy Deisch and Larkin Floyd, rose to meet this challenge. The trio stitched riveted and welded together two much-needed gravel bags, and now we are happy to say that those sturdy bags performed flawlessly on their maiden voyage. On a beautiful weekend in February, our BCHA members worked tirelessly to fill the bags by hand in an area where small rocks and gravel were abundant. 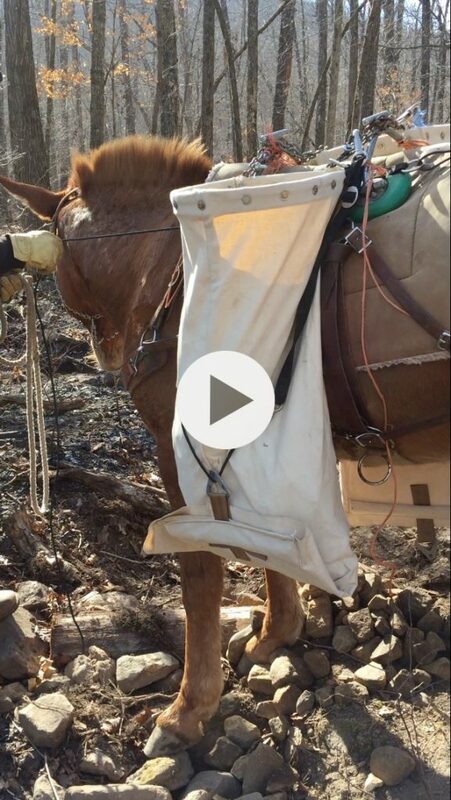 Then, in the first of many back and forth trips, the filled bags were moved to our work site on Cecil Cove, assisted by one of our rock-solid pack mules, Sully. And, here is where the real beauty of this little operation became evident. With a simple rope system designed into the bags, the gravel could easily be offloaded from the bottom. In a matter of seconds, boggy potholes began to fill….potholes once so deep they could swallow a horse up to his hocks. 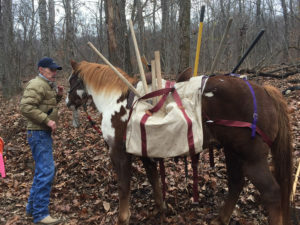 Sully worked alongside several other industrious pack animals that carried panniers loaded with buckets of gravel, but it was the ease of unloading the new gravel bags that made them such a welcome sight for the hard-working crew on the receiving end. While our members are always up to any task, let’s just say that we fit the demographics of an aging organization; so, after several work days that also included installing numerous checks and water bars here in the rocky reaches of the Ozarks, we found it particularly satisfying to watch those holes fill with a little less work on our parts. Homely, plain, and sturdy are attractive qualities when they save an aching back.